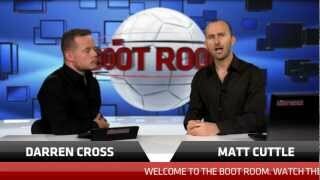 In this episode of The Boot Room, Matt offers up his FIFA 13 skills for Darren’s expert analysis. Starting off with formation, Match Magazine’s Darren Cross recommends choosing one you are comfortable and familiar with. Once on the pitch, remember to hold your shape, and don’t send your centre backs on runs or pull them out of position, as doing so will leave gaps in your defence and leave them vulnerable. Another tip is to try and jockey opponents and stay goal side of them to break down their attack. Keep in mind that you can defend just by keeping your shape and slowing the play down. Darren also recommends the fake shot. To perform one, hold down the left trigger, power up with the shot button and press the short pass to cancel the shot. Let go of the left stick as you do this to stop the ball dead and move into position for a chance on goal. Our two top tips to take away? First, be patient in your defence and be aware of your positioning. And secondly, try to be more unpredictable; mix it up a bit when moving and passing.